You can change the quantity of tickets needed in Pay-Pal when checking out. Please follow through with your payment. choose that option on the Pay-Pal page. To ad multiple items to your Pay-Pal cart, choose "continue shopping" to be directed back to this page. Added fees are for the convenience of using modern technology and for shipping of your ticket stubs. or purchase tickets from one of our sponsors or fire department members. ALL on-line AND Phone orders orders are subject to fees and shipping charges! All ticket numbers are randomly selected when issued. You may NOT request specific numbers. NO general admission tickets available for this event. MUST BE 18 to Enter! - Gates open at 11:00 AM. - Free catered food and beverages from noon to 4:00PM. - Drawings subject to sale of 3,500 tickets of the 5,000 being sold. - Early Bird cut-off date is July 7, 2019.- Early Bird winners must claim by 1:30 PM and be present or award is cut in ½.- C.S.V.F.D. “reserves” the right to change prizes to be awarded of equal value. 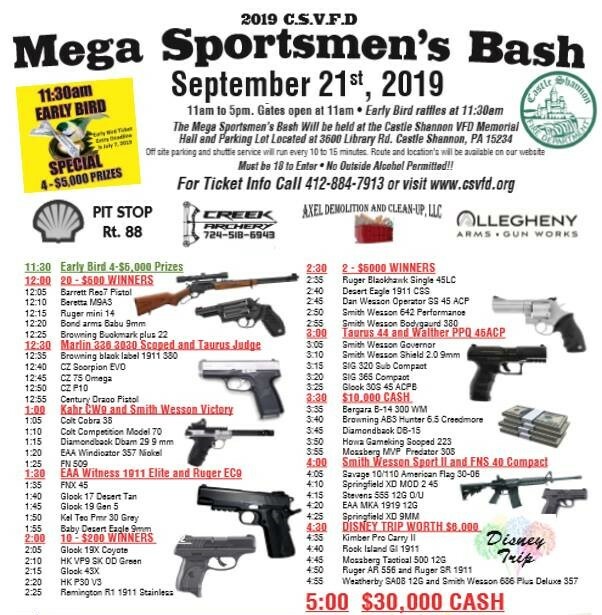 - All gun tax and insta-checks are paid for by the C.S.V.F.D.- Winner need not be present to win prizes on the entry ticket, except for the 4 Early Bird drawings of $5,000 each. - You can win more than once. - Proper identification is required for the prize/s to be awarded. - Income tax on all prizes is the responsibility of the winner. - All entry ticket prizes must be claimed within 30 days. 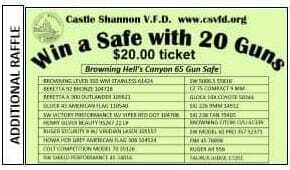 - All winners of prizes on the entry ticket not present at the event will be notified via phone or mail and the winning numbers posted on the website: www.csvfd.org. - Additional Raffles and drawings will be available throughout the day of the event at an additional cost. - All winning prizes for “walk-a-round tickets” and “Pick of the table tickets” MUST be claimed by the end of the event. NO exceptions!- No one may enter the grounds without a ticket. - You must have the ticket and photo I.D. to enter the event. Only one admitted per ticket. No one under the age of 18 will be admitted. - No personal coolers, glass containers, pitchers or alcoholic beverages allowed into the event. - Drinking and Driving are against the law. Taxi service information will be available. - C.S.V.F.D. is not responsible for typographical errors. - There will be a $45 fee on all returned checks. - All decisions of the C.S.V.F.D. are deemed final. - On-site parking available; additional parking listed on website www.csvfd.org. - Buses will be provided for off-site parking every 15 minutes or so. - Additional tents and seating will be available. You may bring your own chair if you want.